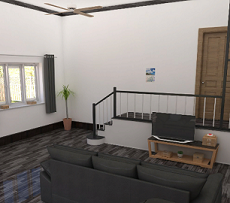 Neat Escape the Living Room is another point & click escape game developed by NeatEscape. I was called to a friend's house. It seems that the living room has been refurbished. I found a note that was saying: "Please escape". I decided to take the challenge! [This game contains html5 components that may not work in browsers that do not support html5.] Good Luck and have fun! I got a kind of beach end but didn't use the hook (or rook as they wrote). After using the hook on all hotspots in the game I realized I could attach it on the pipe. Now looking again for a place to use that. Thanks Hotz, had to leave for a while, resuming now. DOH, I'd totally forgotten that suitcase as in Neat games the blue key is always for the exit... Out now with both ends. Loved it, pity that they are so rare. Hotzenplotz - thanks for the hotspot by TV button! Do colored numbers first, lots of puzzles with few obvious clues. Very sneaky almost invisible white lines on some windows. I guessed the order, trial and error. Two pieces for camera before a clue is revealed. Scale problems with the N and E, look for big letters to fit on the small box. Brilliant game, the graphics in Neat Escape games are always amazing. I did read here about the sneaky hotspot, but that didn't help either, only from the VWT learned the right spot. If mediocre or poor games have such extra sneaky hotspots, then it's just stupid and makes the game even worse. If excellent games have sneaky hotspots, then it's kind of fun, especially when you find the spot by yourself. Do I have double standards? Well... maybe, but I can't help when I'm not going so mad about sneaky hotspots in excellent games. And this game was excellent. Thanks!